This sketchup video tutorial provides the demonstration of Viz parametric modeling sketchup extension. The tutorial briefly explains how to operate through the extension as well as generate a basic parametric model in sketchup. The extension sustains all the modeling history. Parametric modeling means monitor the steps to generate the model in order that the objects are modified in due course devoid of undo and redo the various steps. To get started go to the menu Extensions -> Viz -> Start Viz, or click the Vz button on the toolbar. As soon as the Viz Pro window opens, press Spacebar key to include new nodes. 1. In SketchUp, choose Window > Extension Manager. 2. Click the Install Extension button. 3. A open dialog box will be visible, then navigate to the .rbz file saved to your computer, choose the file, and click OK (Microsoft Windows) or Open (Mac OS X). Watch the following video to learn the complete process to create parametric modeling in sketchup. This sketchup video will introduce the functionalities of 1001bit Tools (Freeware). It is an exclusive sketchup plugin that contains different types of tools to produce architectural components in quickest possible time. GOH CH has developed this sketchup extension. It is compatible with SketchUp 6, SketchUp 7, SketchUp 8, SketchUp 2013, SketchUp 2014, SketchUp 2015. The architectural components range from Staircases, spiral staircase, windows, doors, walls, customized openings on walls as well as automatic creation of hip roofs, rafters and purlins etc. Inside 1001bit tools, there are some effective drawing and editing tools such as fillet edges, extend, chamfer etc. The users can also save the parameters, which are normally utilized, for easy selection in future. Templates in SketchUp are the place where you are drawing on. Each template defines the type of your project. Depending on the applications, SketchUp comes up with an array of templates. The most common concentrated fields for SketchUp templates are – architecture, construction, urban planning, landscape architecture, woodworking, 3D printing, and more. Templates generally define unite of measurement of your model. Each template has a specific default unit that helps you create a design easily with maintaining the accuracy. For example, if you are doing a woodwork project, then the unit should be in millimeters and inches because accuracy is a must-to-have thing in this case. For creating a building model, inches and millimeters will definitely irritate you. 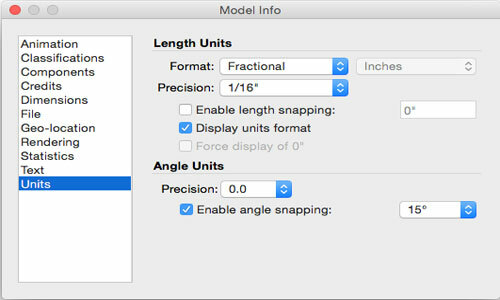 Each model needs a different unit to measure the model, and right templates make your job easier for you. There is another option called custom template that allows you to add your preferences to the template. Sometimes the default ones seem not enough as per your requirement. In this case, you can customize the details to make it fit for your model. The list below contains the things you can add or modify in custom setting. The model info dialog box gives you information about a model. You can change the needed fields as a default for your model. • Save Geometry for your template: when you save geometry to a template, then the models based on the same template will also add the geometry. It works as a default. • Styles: you can work with an array of styles in SketchUp. The Style browser has as many types as you want. The common options include edit edge, face, background and watermark. • Shadows: Shadows give your design a complete touch. Maintaining the right shadow behavior is a necessary thing. The option is not default, though. You have to turn on shadow separately as the feature consumes much computer processing resulting in a slow performance. • Window > Preference for Microsoft Windows and Sketchup > Preferences for MACOS X. • Select the Template option from the sidebar. • Choose a template from the drawing templates box and then click OK. Create a Template: Creating template will help you start your work without giving time in changing the default option of templates. If a set of changes has always been used, then save it as a default. This option proves more beneficial than you could ever imagine. Follow the steps to do this. • Start a new SketchUp file with your present template. • Add all essential modifications such as style and shadow to your SketchUp. • Select File > Save option. • Animation: to animate your scene, you can set transition time between scenes. • Classifications: this feature will work on the classification data and BIM. • Components: you will learn how to add changes in a set of components in your model. • Credits: credits let you know the owner of the model or components. You can also Claim Credit to add the license holder’s name to the model. • File: this represents the details of a file. • Geo-location: you can make your model geo-located by adding location through Google. Besides the above-mentioned options, you can also get features like rendering, statistics, texts, and units. The Model Info Dialog Box has come up with the options that you want to have to create your design more smoothly. The content describes steps and information associated with the SketchUp Template. You have to have detailed knowledge regarding this particular tool since it forms the base of your design. Till date, different experiments and innovations have been made with SketchUp. But this one is indeed the creative one that opens up another perspective of the 3D modeling software. SketchUp has already been proven as an effective tool for designing real objects and its applications go far beyond your imagination. SketchUp has been used as the primary tool of designing TrussFab structure, which is new in concepts and ingenious in appeal. TrussFab is the system of fabricating a large structure that is strong and tough enough to withstand the human weight. The process has designed a large-sale structure made of plastic bottles where bottles are used as beams instead of bricks. Node-links are used to keep this fabrication settled always, even in loads or pressure. The best thing is that it does not require sound knowledge in engineering and designing. Phd researcher Robert Kovacs has recently created a large-structured trussFab using the plastic bottles. His team from Human Computer Interaction Lab from Hasso Plattner Institute in Potsdam, Germany has given a complete support to achieve this high. They made an end-to-end large-scale structure which is sturdy enough to stay unaffected. The use of plastic bottles and 3D printing joints make the things even easier to construct for the team. TrussFab uses plastic bottles to make rectangular trusses that are called the building blocks for designing a large scale TrussFab. SketchUp is offering TrussFab plugins that allow users to design the structure digitally prior to the construction. This plug-in also converts an existing structure into TrussFab one smartly without your intervention. TrussFab SketchUp Editors has primitives that are used as building blocks for designing the model digitally. 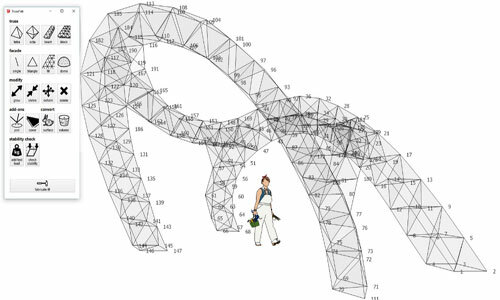 Generally, tetrahedron and octahedron shapes are available for designing trusses. Once the model is complete, the plug-in generates 3D model file for each node, which can be sent to the 3D printing. With this SketchUp plugin, 3D printer and necessary materials, anyone can try their hands at designing TrussFab. This fabrication of large-scale structure made of waste materials gains popularity across the world. Designers also exhibit their creativity by making different models using the rule of TrussFab. TrussFab presents an amazing application of SketchUp. Before this, the 3D modeling application has been famous for many creative projects like designing a playground with waste materials. The playground has become a successful venture in distant areas in the world and it earned appreciation from government and non-government organizations. TrussFab is also gaining publicity as the nascent designers come up with plans to design big structure. 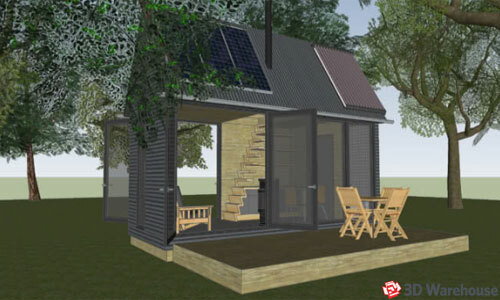 SketchUp is the core platform where designers can test their skills virtually. This sketchup video tutorial is presented by Justin Geis. In this tutorial, Justin shows how to generate a pattern on the basis of voronoi diagram with the purpose of produce a nice organic shape in sketchup. To produce this organic shape successfully, Justin uses various most recognized sketchup plugins like voronoi, conic curve, JHS power bar and shape bender. With voronoi and conic curve, it is possible to generate a Voronoi diagram from guide points cloud as well as nice cutouts in those cells (conic curves). Chris Fullmer has developed the shape bender plugin. It is a nice tool to warp objects over curved paths. With this tool, one will be able to generate curved objects with precise correctness. It is recommended to work in top view while applying voronoi XY plugin. The tool facilitates the sketchup users to indicate what area should be suited over a path and the shape bender plugin automatically adjusts the object over the path. Christina Eneroth is the developer of Eneroth De-DC-ify. This newest sketchup plugin is compatible with SketchUp 2016, SketchUp 2017, SketchUp 2018. This plugin is suitable for different industries like Architecture, Construction, Education, Engineering, Film & Stage, Gaming, Heavy Civil, Interior Design, Kitchen & Bath, Landscape Architecture, Urban Planning, Woodworking and Other. Eneroth De-DC-ify cleanses Dynamic Components of their dynamicness and converts them into regular components. The role of the plugin is to safeguard your intellectual property prior to deliver a model with custom DCs to a client. It is also useful in case you do not prefer to use Dynamic Components and just would like imported components to perform as normal components. Watch the following video for online demonstration of the plugin.